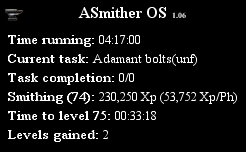 The script also contains advanced antipatterns to provide fast and as safe as possible leveling. Supports usage of Super/Normal Energy and Stamina potions. does this script support cannonball smithing? 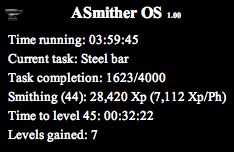 just a minor thingie, when you bank and take out new ores (when smleting) the mouse goes to the armour thing on invent and hovers over it for acouple of seconds. yet it does this everytime. doesn't that make it obvious it's a bot? or do they not check this? Not sure why it does that but I'll check it out, thanks for reporting. I did not have this interface mapped yet. It has now been fixed, thanks for reporting. Great script! Although the script doesn't seem to equip a ring of forging, Please look into this. everything else works good so far. - Added script version to paint. - Updated walking and object interaction. I've updated both things that you've posted you were having issues with. Let me know if this still happens to you. 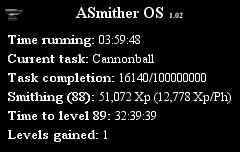 Tested cannonballs making and it worked fine. Restart your computer and try again. If it still wont work for you please post scripts log when the issue happens. 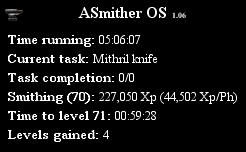 To find the log go to Help -> View Log in RSBot client. 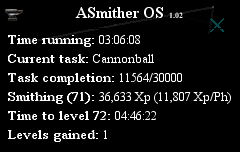 Script is great, used this multiple times prior to the recent update, made 4k cannonballs smooth, no problem. 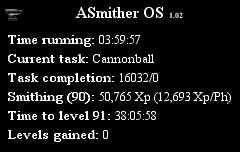 However, as of recent, it's been playing up slightly, what I mean is that when it banks at edgeville and returns to smelt the cannonballs, it just stands by the furnace for some time detecting the furnace (I hopped around to test if it was because of the number of players) but it also just stood there hovering over the steel bar, and sometimes moving the cursor over the coal bag (inside the furnace hut). Just feel like this will make it more risky and easily detectable. The client is partially broken due to most recent rs update: https://github.com/powerbot/powerbot/issues/1245. Should be fixed with next client version. This script is really quite broken... For cannonballs, it will run fine for the first inventory if you start it full of steel bars. After finishing the load it will be able to bank fine, but always on the second trip it catastrophically fails. After approaching the furnace, it will right click and hover over the steel bar, making little circles with the pointer until logged out. Either that or it never even finds the bank. As I'm typing this I realized that when it fails to find the bank, it is due to the roofs. I turned on the constant roof removal and it completed the second and third batch perfectly... interesting. However there is still one more glitch where it constantly right clicks the steel bar as you are running from the bank to the furnace. Here are some logs. Sorry for the long post! EDIT: After running for awhile longer, it once again ran into the issue of hovering the steel bars. It seems to be that if it fails to click the furnace after right clicking the bar, it will be stuck there forever. 0813 [DjikstraPathfinder] Found path to (3270, 3166, 0) in 0ms! 0813 [DjikstraPathfinder] Found path to (3275, 3166, 0) in 0ms! 0813 [DjikstraPathfinder] Found path to (3275, 3170, 0) in 0ms! 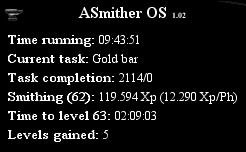 0813 [DjikstraPathfinder] Found path to (3270, 3166, 0) in 1ms! 0814 [DjikstraPathfinder] Found path to (3270, 3166, 0) in 0ms! 0814 [DjikstraPathfinder] Found path to (3276, 3180, 0) in 0ms! 0814 [DjikstraPathfinder] Found path to (3281, 3187, 0) in 0ms! 0814 [DjikstraPathfinder] Found path to (3281, 3187, 0) in 1ms! 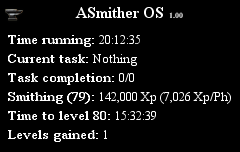 Super slow banking & smithing, ring of forging not being used, waste of time script at current state. The script is currently broken due to client issue: [url=https://github.com/powerbot/powerbot/issues/1245]https://github.com/powerbot/powerbot/issues/1245[/url]. Please wait for new client version.